Don’t think you need to head to the local coffee shop for a delicious cup of espresso. With the DeLonghi EC702 15-Bar-Pump Espresso Maker, you can brew up espressos, cappuccinos and lattes from the convenience of your home. With an array of practical features, you can achieve the perfect cup of coffee for you and friends, while having fun with a beautifully designed machine. Taking convenient pods or ground coffee, the possibilities are endless. What’s So Great About the DeLonghi EC702 15-Bar-Pump Espresso Maker? Attractive: Today’s appliances are designed to be stylish and enhance the look of the kitchen, and this DeLonghi espresso maker is no exception. It’s designed from stainless steel instead of plastic and has a streamlined design that allows it to fit compactly on the counter. The stainless steel looks especially great next to steel appliances and keeps consistent with the high-end appearance of espresso machines. Design: This espresso maker has a great no-drip design that focuses on making quality espressos, while keeping comfort in mind. While other espresso machines lack space between the bottom of the filter and the base, this machine leaves plenty of clearance. This is a great feature if you like to drink espresso out of a larger mug. The DeLonghi EC702 is easy to keep clean as well, with a pop-out drain rack and drip tray. Features: This DeLonghi espresso maker is a step above others, as it offers a variety of practical features that make brewing espressos fun and enjoyable. The self-priming option allows you to pre-set the machine and skip over the start-up preparation, while the large removable drip tray is perfect for quick clean ups. You can also enjoy a warming tray, 44-ounce water tank with water-level indicator and on/off switches. Brewing Options: You can use ground espresso or Easy Serving Espresso (E.S.E.) pods to make your espresso drinks. There are two separate thermostats so that you can reach the perfect temperature by controlling both water and steam pressure. There are also fun gadgets that help make the perfect espresso just the way you like it. A patented cappuccino frother mixes steam and milk to create a rich and creamy froth, while the 15 bar pump and stainless steel broiler are perfect for creating delicious espresso drinks. What’s Not So Great About the DeLonghi EC702 15-Bar-Pump Espresso Maker? Preparation: Don’t think you’ll be able to start up your espresso machine and start making drinks right away. It’s recommended that you run water through the machine a few times, but know that you’ll make about five to six cups of espresso that probably won’t taste that great. Machines essentially have to be “broken in” in order to reduce the metallic taste that you’ll see in the first few cups. Not only will you have to dump a few espressos, but you’ll want to use cheaper grounds that won’t be so disheartening to waste. Noisy: If you’re an early riser and don’t want to disturb anyone when making an espresso, this machine may not help your cause. It’s certainly loud, but only for about 30 to 40 seconds while the coffee is being produced. Noise is a common gripe in regards to pump machines, so you may not find another pump machine that is any quieter than this DeLonghi. Tamper: The DeLonghi EC702 comes with a built-in tamper, although a separate metal tamper may work better. Since the machine is not that heavy, you’ll have to hold it down when you use the tamper. The device also works by pushing upwards, whereas most tampers work when you push them down. If you don’t like the tamper, you can purchase a separate one, otherwise you can find the sweet spot to using this built-in gadget. Is the DeLonghi EC702 15-Bar-Pump Espresso Maker a Great Purchase? 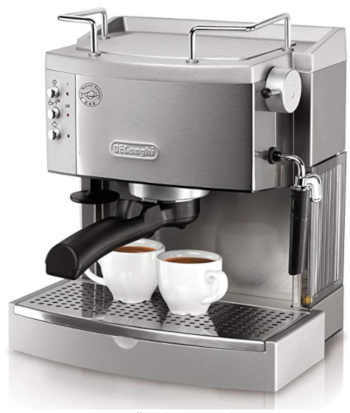 The DeLonghi EC702 15-Bar-Pump Espresso Maker is an excellent purchase for the espresso lover. The machine comes at a great price and is jam-packed with features such as a convenient cup warmer and steam wand. The machine is also super easy to keep clean and has great clearance for large or standard espresso cups. You can’t beat the options you have with this machine and how much you’ll save from buying espressos, cappuccinos and lattes from the local coffee shop. Best of all, the DeLonghi EC702 is fast, so you’ll never have to wait more than a few minutes for a fresh cup of espresso.